There is a MAJOR blogging conference going down this coming weekend that would be AWESOME to go to. But well, while someday that may happen, that day is pretty much light years off. In the meantime, there is a group of bloggers who are participating in Blogher @ home, because well, this conference is huge but not everyone is lucky enough to go. 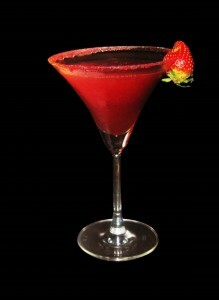 Anyway, one of the contests with a FABULOUS prize is to post on your own personal blog, a recipe for a drink. Should it be alcoholic or virgin doesn’t matter. (Though knowing these girls, the more booze the better.) I can totally do that because I have a drink in mind! And it’s stupid simple at that! The catch is, like everything I make (all 3 things) there are no measuring involved when I do it. Which in this case is fine, because you can make it to taste. I should warn, this comes out OH SO THICK. If you bring it to your lips and tip to drink, you’ll get a face full. A straw is best, but even then you’ll struggle. So you can’t exactly chug this. But oh is it SO worth the work.